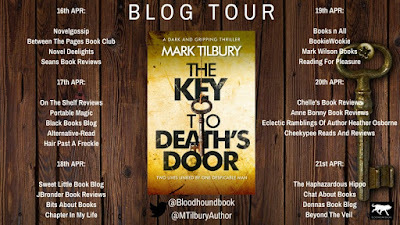 Welcome to my stop on the blog tour for The Key to Death's Door by Mark Tilbury. I'm sure you all have your favourites authors, the ones who when you know they have a new book coming out, you just know that you HAVE to read it. You don't need to know what it's about, you don't need a blurb . . . you just NEED to read it. Well Mark Tilbury is one of mine and deservedly so. Lee Hunter is a typical teenager, getting into scrapes and looking for adventure, but when he and his best friend, Charlie Finch, decide to spend the night at a local derelict boathouse no-one could have forseen the terrifying consequences it would have for both of them, but in particular Lee. A severe overnight storm leaves the boys without any method of getting back to the shore so they decide to swim across the river. Charlie makes is back safely but Lee isn't so lucky, he disappears under the water and then blacks out. When he comes round is isn't where he expects to be and nothing is quite as it seems. Lee is going to wish he was back in the river, drowning. The Key to Death's Door is a book that once read, will stay with you for a long time after you've read the final page. A tale of true friendship between two boys and I felt that the author really captured the essence of their friendship, making them feel real and because of that I really sympathised with their situation. Once again the subject matter is hard-hitting, there's animal cruelty, child abuse and torture to name just a few, but this is exactly what I've come to expect from Mark Tilbury's books and as strange as it might sound, this is why I'm drawn to them so much. I know that I can completely immerse myself in the story and become blissfully ignorant of everything that's going on around me. As always with Mark's books there's one character that made my skin crawl, to the point where I almost couldn't bear to read his name. After 'meeting' the truly repugnant Detective Carter in The Abattoir of Dreams I was pretty sure that no other character could ever come close to being as vile as he was, but boy was I wrong! Daryl Finch is the mother of all heinous characters and he certainly outstayed his welcome in my head once I'd reached the end of the book! I'm sure he even visited me in my dreams about a week later. . . . .and that's just rude as well as a little disturbing! 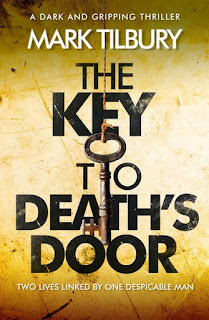 I can guarantee that The Key to Death's Door will give you palpitations . . . . but you'll love it, I know I did. 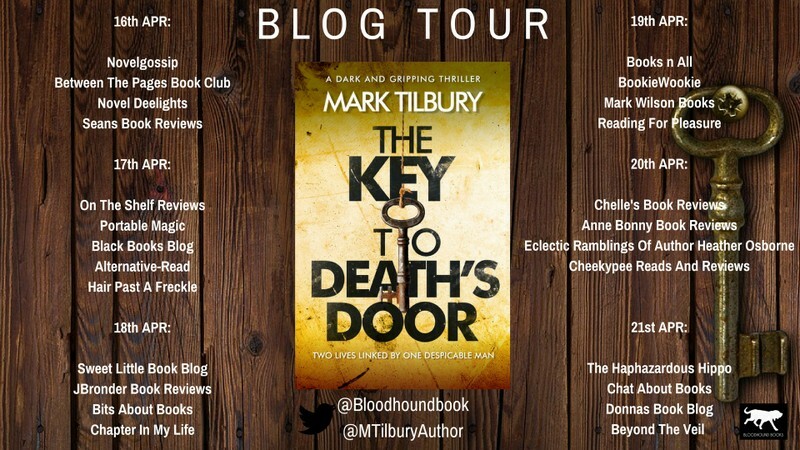 Mark Tilbury is fast becoming an author to be reckoned with when it comes to dark and gritty thrillers, so if that's your thing this is one book and author that needs to be on your radar and more importantly on your TBR. WOW! 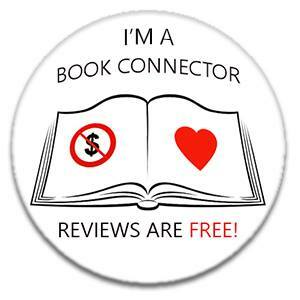 This #TwistedTilbury loves that review and that I'm one of your favourite authors. Thank you, and for helping with the tour. Hello there and thanks for checking out my profile! I'm Neats and I'm a voracious bookworm who is never without a book or my much loved Kindle. I have an eclectic taste in books and I enjoy immersing myself in lots of different genres. 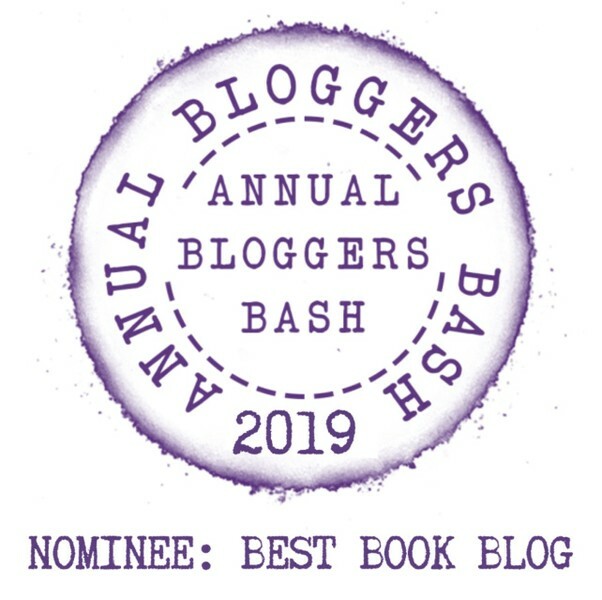 My favourites include contemporary and women's fiction, historical and psychological thrillers. I love big books and I'm nearly always tired from having read 'just one more chapter' before switching off my light at bedtime. I'm always on the look out for recommendations from fellow bookworms so if you've read something fantastic then let me know. My other loves in life include my gorgeous little cockatiel Tufty, pachyderms (although you might have guessed that one already! ), black coffee, plain chocolate and prosecco. 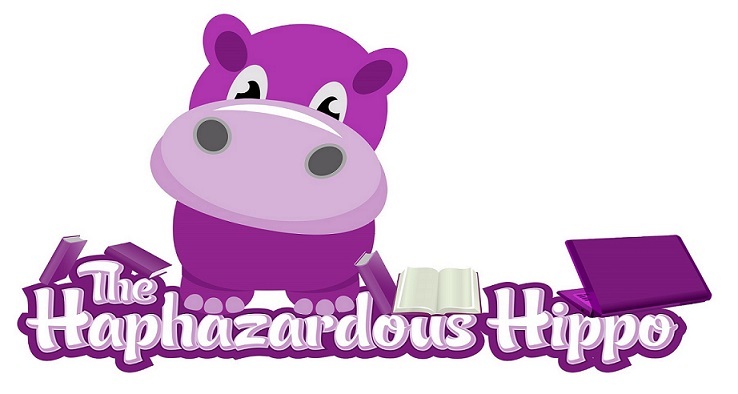 © 2015 The Haphazardous Hippo. Simple theme. Powered by Blogger.